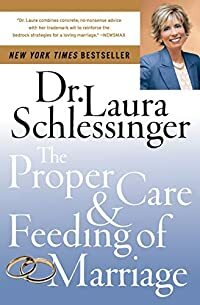 In the long-awaited follow-up to her groundbreaking, million-copy bestseller The Proper Care & Feeding of Husbands , Dr. Laura now focuses on how men and women need to understand and appreciate the uniqueness of masculinity and femininity; what the best ways to relate, caretake, and nurture each other are; and how to bring a marriage back from the brink of disaster. Dr. Laura asserts that in order to produce and sustain a wonderfully satisfying marriage, spouses must recognize and appreciate the polarity between the masculine and the feminine. Both husband and wife have power in the relationship, and each needs to realize this in order to ensure personal satisfaction. Using real-life examples from her call-in radio show, and giving real-life solutions, Dr. Laura focuses on the typical mistakes made by men and women in their relationships and shows how marriages can not only survive but thrive.